If you need not worry about the spending limit, these strollers are a must-have! These strollers are ideal for celebrity kids, with parents bringing home a six figure pay check. 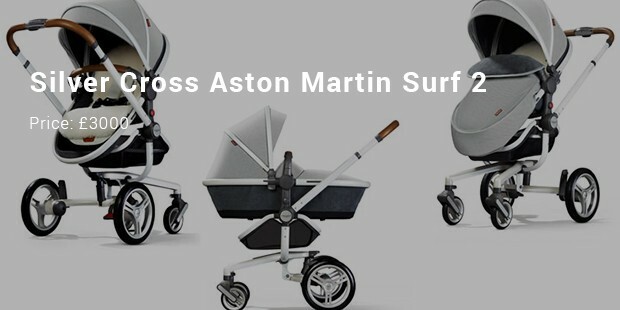 Today, we are presenting you with the most expensive strollers in the world! The costliest on this list is priced at a whopping amount of £1383 and the cheapest, rather least expensive, is £1240 only! Yes, it is an extremely pricey bargain, but if you keep those pounds aside, they are, undoubtedly, the coolest and most striking strollers you will ever get to push! Let’s have a look at some. The Silver Cross Balmoral has a history dating many decades! It has been the personal favourite of the Royal family of Great Britain since it was first created in 1877. 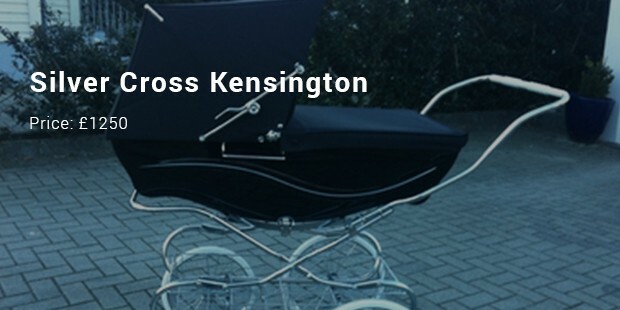 It is popularly dubbed as the Rolls Royce of strollers! This is an exclusive line of strollers. It comes with a stunning price tag of 3000 pounds! 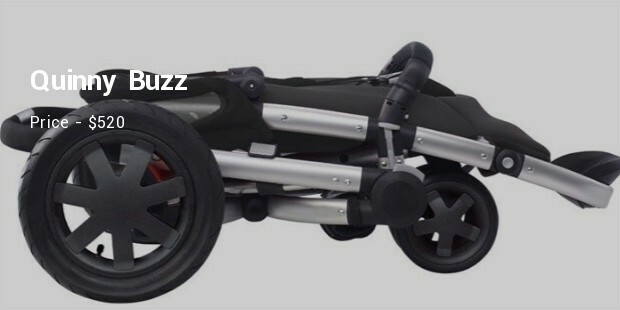 We are quite certain that if James Bond were given a choice, he would push this stroller! It has its own certificate of authentication. If it’s Versace, it has to be cool and if it’s Versace, it has to be pricey! It is completely embraced with a brocade fabric and an adjustable base because of which, it functions both as a pram and a rocker! 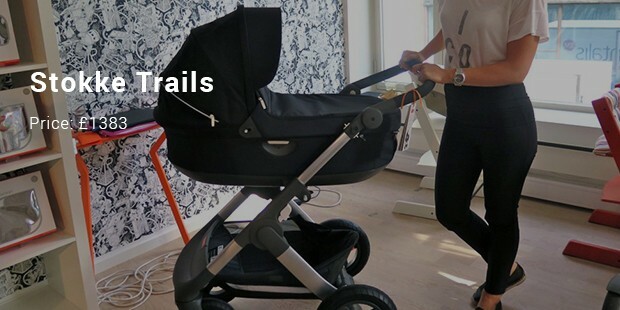 This stroller is presented by the Dutch creator, Bugaboo. 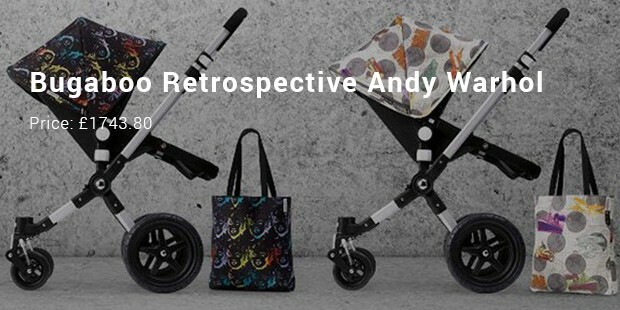 All of its four strollers are patterned out with altered Warhol images. This stroller is priced at £1743.80. The limited edition buggie’s also consist of Marilyn Monroe screen-print figure and also best mobile feel! This limited edition stroller is extremely beautiful and efficient too. iCandy Peach is unique with its numbered chasis, cotton fabric, and illustrations including the London Red Bus. You will also get a certificate of authenticity when you buy this stroller. Stokke Trails is designed for all types of weather. 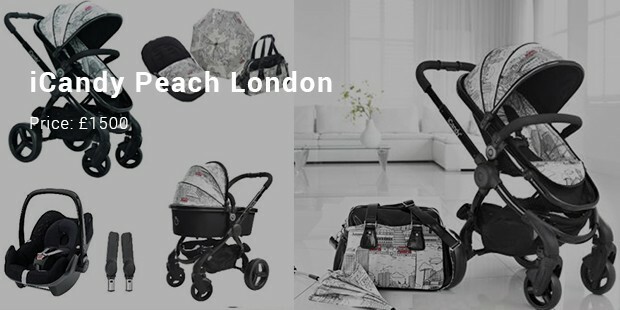 This stroller has a waterproof shopping basket, ventilated hood, travel system, stroller seat and pram accessories. A robust stroller with advanced wheel suspension and air filled rubber tires. 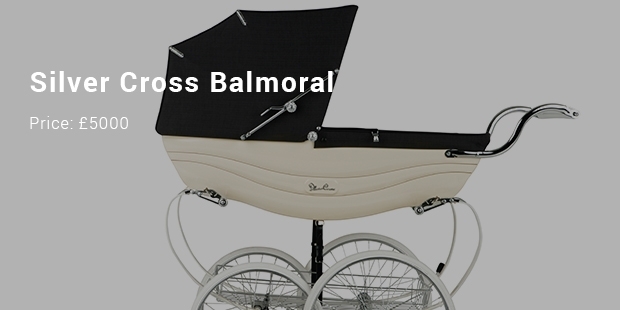 A classical styled pram suited for modern day usage. Silver Cross Kesington has a folding chassis and detachable body. The entire stroller is hand painted and has hand stitched fabrics. All this make this stroller extremely likeable. 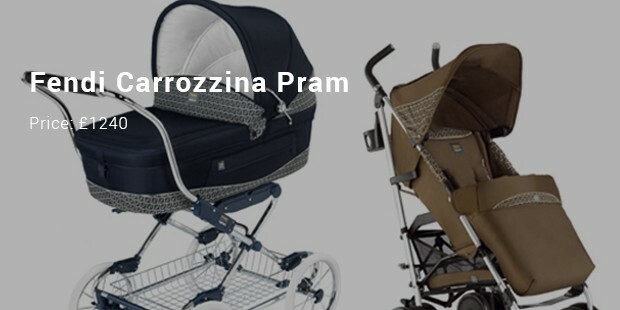 Fendi Carrozina Pram is known to be classic and charming. It has a chrome plated framekwork and hand stitched leather sewn handlebar. Babies will draw maximum attention in this pram. Many celebrities like Kim Kardasian and Sarah Michelle Gellar and Tori Spelling love the Orbit Baby Stroller, so it has achieved a celebrity status. 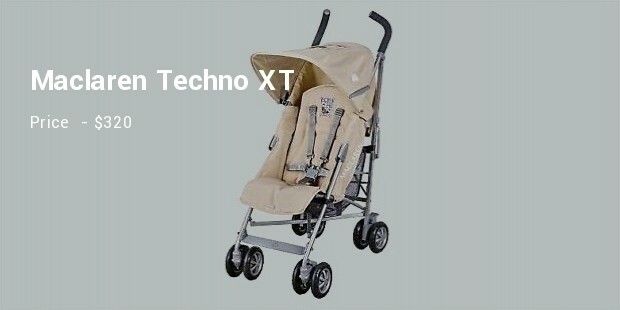 Made of eco friendly material, this stroller is sleek and sturdy, just desgined to last. 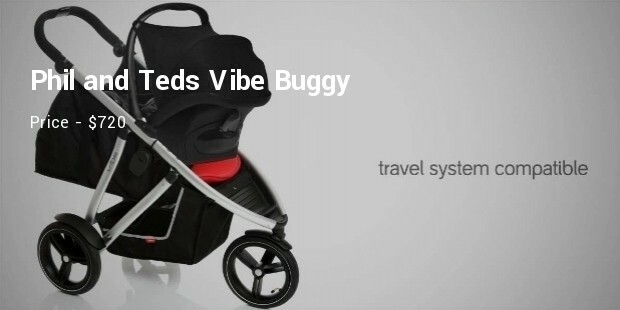 Phil and Teds Vibe Buggy is made for a growing family. Designed to hold one baby, this stroller can be converted to hold another when the family grows bigger. Parents love this expensive buggy for it establishes an emotional connect with their kids. 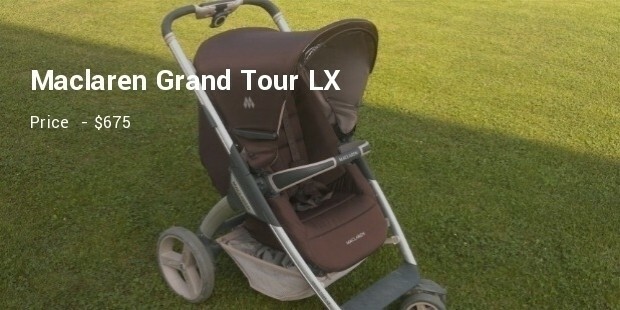 Maclaren Grand Tour is an expensive yet stable pram that celebrities use. It has thermostat, lights, remote-controlled reflectors, and the like. Impressive and sturdy, this pram is just loveable. 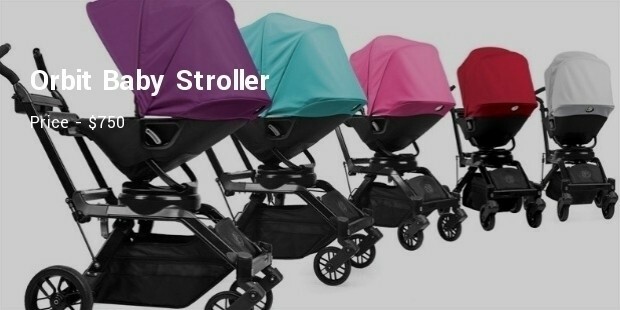 There are a variety of colours to choose from and this makes the pram special. Quinny Buzz makes the lives of parents easy. It has a two way recline, travel system, carry cot, and infant car seat. Parents can use the pram for any age. The automatic unfolding makes the pram easy to use. For parents who want a stroller for their new borns, then Maclaren Techno is the best pram. This stroller has 5 point harness which allows the new born to lie down safely. Light weight and loaded with features this stroller can accommodate babies of any weight. 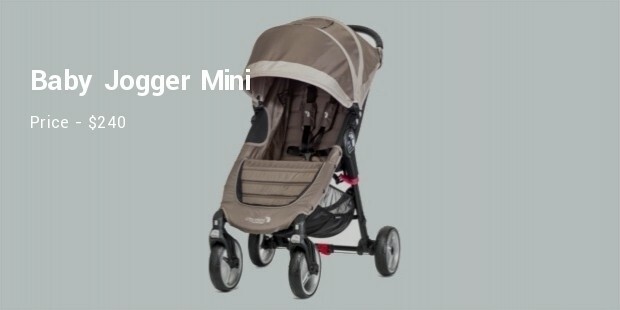 An award winning stroller, Baby Jogger Mini is for parents who are forever busy. A superb stroller for urban parents, it provides comfort and safety to the little one. A really efficient stroller. 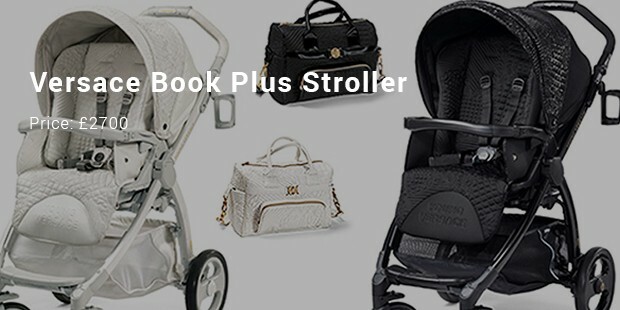 These strollers are chic and luxurious to look at and extremely efficient when it comes to their functions! They are something you would love to lust on, and if you have those extra bucks, what are you thinking about? Go, get them!